Of the books I read while on vacation this past week – or all the books I’ve read yet this year – this is my favorite. 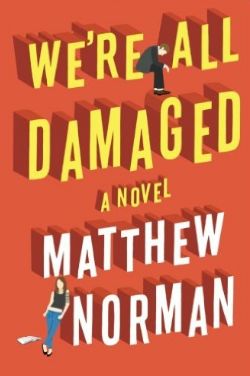 We’re All Damaged is a novel that, in my mind at least, goes in the same category as The Junk-Drawer Corner-Store Front-Porch Blues and The Art of Racing in the Rain: introspective novels that delve into the reality of life, and the fact that all’s not always sunshine and unicorns. Andy, Matthew Norman‘s main character, is definitely damaged, having lost his wife, his job, and his way. A family emergency pulls him back from New York, where he’s hiding from himself (though he’d probably not admit it), into the mess of his life. “That’s stupid,” I say. But maybe it isn’t. Maybe, in fact, it’s brilliant. My parents are Catholic. Technically Jim and I are Catholic, too. Maybe this is how Catholics do it. We accept a certain level of unhappiness—like we have an unhappiness equilibrium built into our brains—and then, one day, we drop dead. While dealing with – or not – the family and friends and his history with them, he meets someone who will change everything.